It was a leap sweeps this year, with local Nielsen ratings confirming KDKA-TV's strength in news broadcasts from lunchtime on. The most recent book, which began Feb. 2 and closed Feb. 29, had KDKA first at noon, 4, 5, 6 and 11 p.m. This includes both household ratings, which represent a percentage of the roughly 1.1 million TV households in the Pittsburgh market, as well as demographic ratings, a percentage of persons age 25-54. The only bump in the sweeps road was the half-hour beginning at 10 p.m., when KDKA news on WPCW was second to Channel 11 WPXI on WPGH. Although the evening newscasts ratings have for several years now been business as usual, morning shows frame the biggest changes. 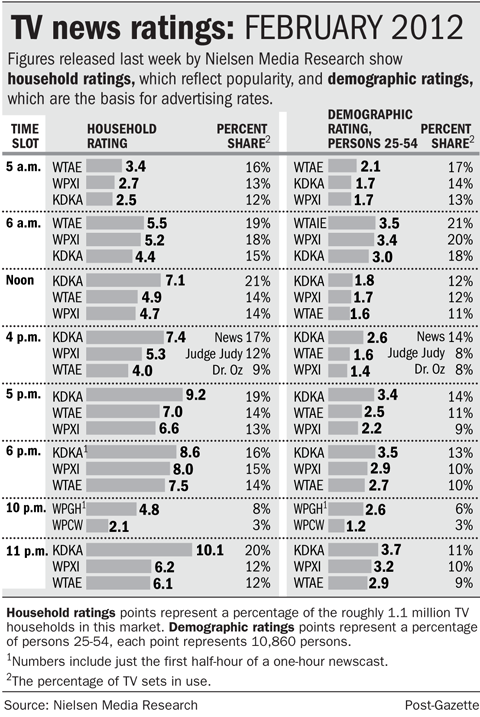 At 5 a.m., WTAE still leads the pack with a 3.4 household rating and 16 share. WPXI (2.7/13) and KDKA (2.5/12) follow. In that same hour, WTAE increased its demo share lead slightly, up to a 2.1 rating/17 share, with WPXI (1.7/14) and KDKA (1.7/13) virtually tied. At 6-7 a.m., WTAE, WPXI and KDKA maintained their status quo in household, but in demo 25-54, WTAE (3.5/21) flip-flopped with WPXI (3.4/20) at first and second since the last sweeps period in November. Overall, one of the biggest leaps in this leap sweeps was at 11 p.m. Although KDKA with 10.1 household and 3.7 demo ratings slightly increased its lead, WPXI nudged ahead of WTAE for second in the time slot. A year ago, the NBC affiliate had a 5.8 household rating and 11 percent share, compared to WTAE at 7.9 and 15 percent. New figures have WPXI at 6.2 and a 12 share, with WTAE at 6.1 and 12. In November, WPXI had a 2.8 rating and 9 share in the 25-54 demographic, compared to WTAE at 3.2 and 10. This time around, WPXI was second in demo at 3.2 and 10, with WTAE trailing at 2.9 and 9. The next Nielsen sweeps period begins April 26. KDKA anchor Susan Koeppen, who returned to the CBS station Jan. 23 after recovering from a cardiac event, anchored the 6 p.m. news with Stacy Smith during this recent sweeps period. She is scheduled to have surgery this week to repair a heart valve and when she returns in May, she will eventually work back up to anchoring the 6 as well as the 11. In her absence, Kimberly Gill likely will handle the 4 (with Mr. Smith), 6 (Mr. Smith) and 11 (Ken Rice) on many occasions. Kristine Sorensen and Mr. Rice are anchors at 5 p.m.